Beaches, waves, deckchairs and flip-flops… Chopard, not without humour and cheekiness, is celebrating the pleasures of an endless summer with the latest model in its Happy Sport collection: the Happy Beach Chrono. With its generous 42mm case in 18ct rose gold, the Happy Beach Chrono will leave no one cold on the warm sandy beaches this summer. 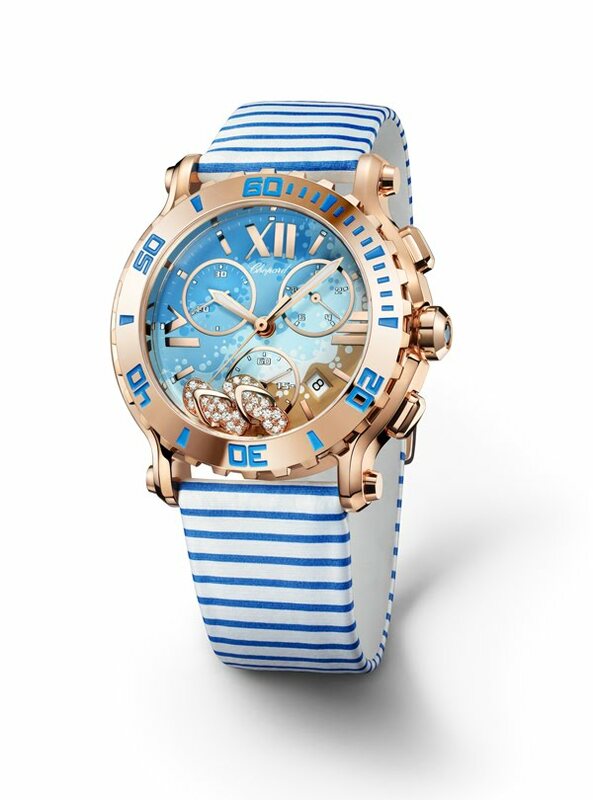 With its painted dial representing a strip of sand swept by the waves and its little moving flip-flops set with diamonds, it leaves no room for doubt: with no little humour, Chopard is celebrating the theme of the beach, the summer and the pleasures they bring. Presenting the chronograph and date functions in a window eccentrically placed at 4.30, the Happy Beach Chrono is powered by a quartz movement and remains water-resistant up to 30 metres. Its rotating bezel in 18ct rose gold is topped with blue gloss indicators, while its crown, also in 18ct rose gold, is set with a blue sapphire. Finally, in a nod to the beach chairs of yesteryear, the Happy Beach Chrono’s water-resistant brushed canvas strap is white with blue stripes – just as it should be.